I woke up earlier than expected and checked out my buddies who were still dead to the world. 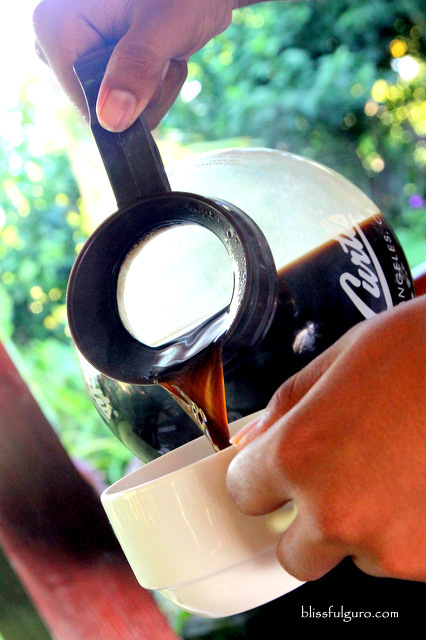 I climbed out of bed and stumbled my way into our coffee nook and prepared my coffee. As I parted the heavy draperies of the door leading to our private veranda, I noticed the first flush of morning over the verdant rice fields. I forgot the last time I felt this enlivened. 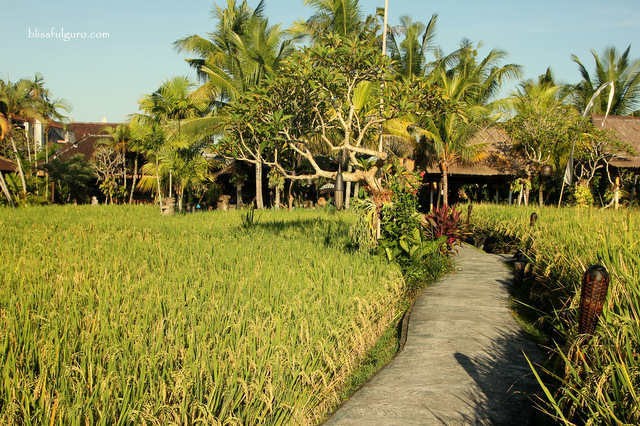 It was our third day in Bali and we’ve already had some few stints of diving and beach bumming but we wanted to see more so we moved to Ubud and went straight to our home for four days – Bebek Tepi Sawah Villas. It was already evening when our private car from Bali Golden Tour collected us for the transfer; the cheaper and faster way to go around Bali (Bali is such a huge island). 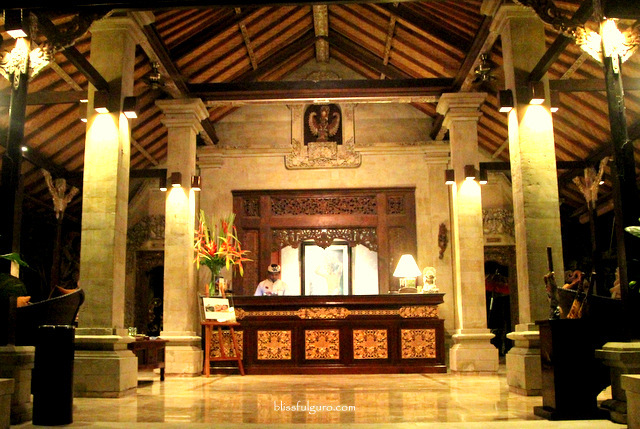 It took us an hour or so to reach Ubud from our swanky resort in Kuta. We were greeted by a staff that immediately assisted us in our reservations. Checking in was swift and we were led to our villa in no time. 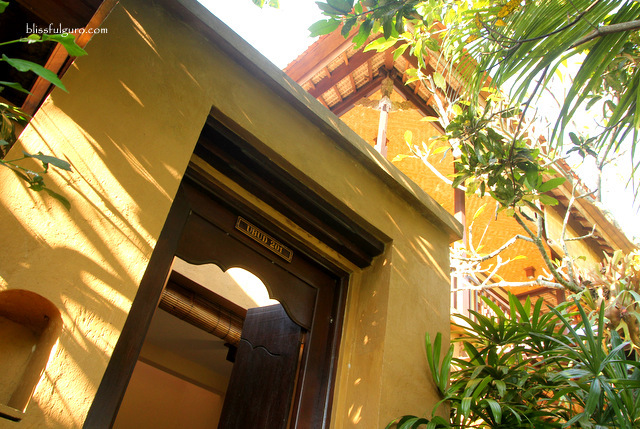 Think about lush tropical gardens and verdant rice paddies as the perfect setting for a peaceful retreat. Bebek Tepi Sawah Villas is located two kilometers away from Ubud Village Center, the perfect seclusion from the goings-on in town. They have 25 Balinese-themed units that are adorned with art pieces from local artists (Ubud is considered as the art hub of Bali). 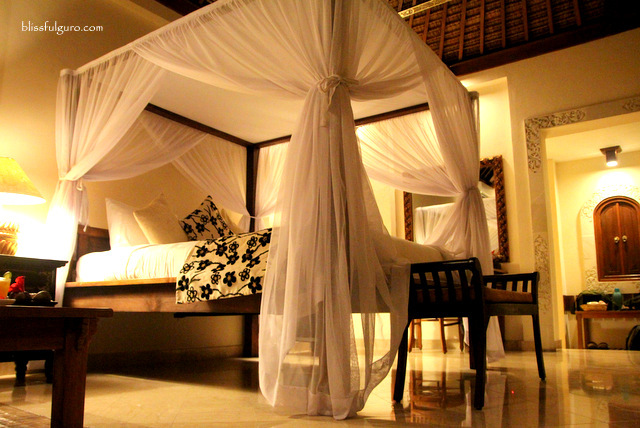 Our assigned room is located on a two-storey villa that houses three rooms (check for discounted room rates). We chose the room on the upper level that has its own gate. Our 52 sq.m. 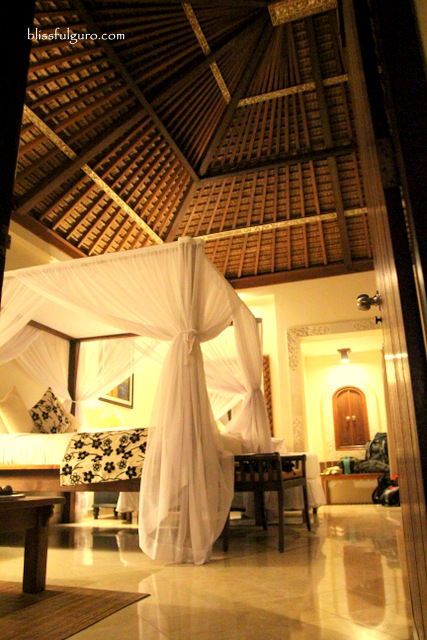 Batuan Villa was huge, the focal point being the four-poster canopy bed; it has its own living area, satellite T.V., work desk, closet, in-room safe, mini-bar, coffee and tea-making facilities and a private veranda. 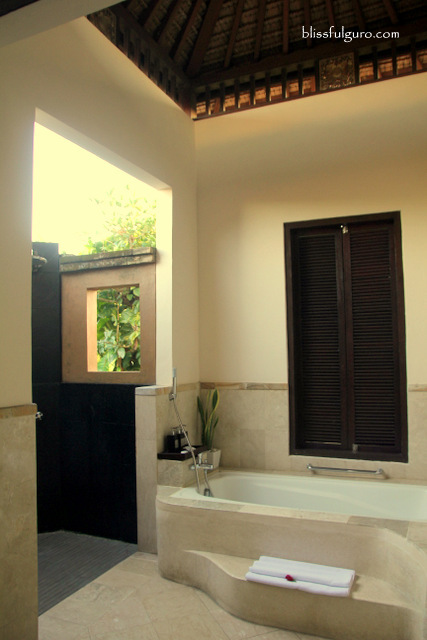 A small passageway led us to the en suite toilet and bath that was so grand. There’s a bath tub, a vanity area filled with toiletries and an outdoor shower area with hot and cold shower, yes, outdoor shower. Imagine us bathing under the moonlight that night. Our stomachs grumbled as we settled in our room. Bebek Tepi Sawah Restaurant was just next door but sadly, it was nearing its closing time so we didn’t get the chance to try it out (A Classical Legolang Dance Performance is shown here every Sunday at 7:30 p.m). We went out to grab some chow and realized that there was nothing available at that time. Apparently, the whole town shuts down at around ten in the evening. We walked some more and found a warung (eatery) that satisfied our needs. Later that night, we chilled at the private veranda for our nightly booze revelry, we were too lazy to go out and party at the city center for everything shuts down before the wee hours. We had some chat time on travel booboos, mishaps on the road and other stuff. 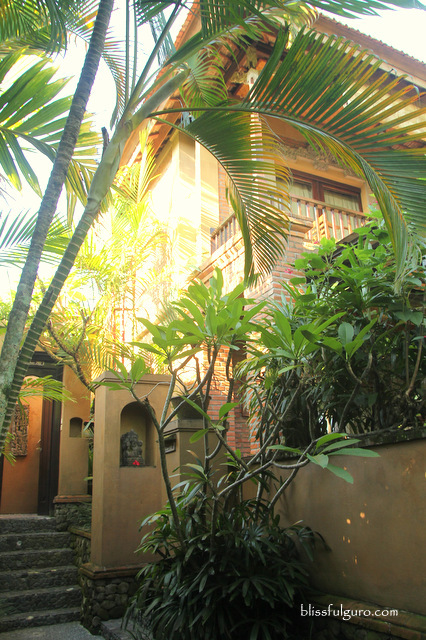 We often break the stillness of Ubud when we would burst into sudden laughter, in unison. Waking up with a nice view of the rice paddies every day was refreshing. I usually wake up early to catch the sunrise while having my morning coffee. 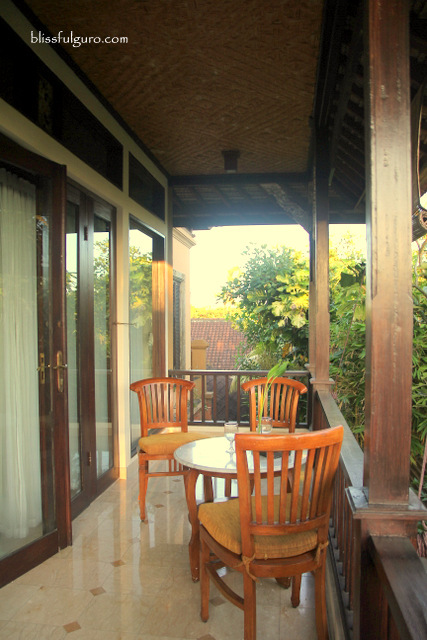 The everyday daybreak was magical, it radiates through the very rustic scene from the veranda. After that morning ritual of mine, I would go back to the room and try to wake my buddies, but to no avail. I would then explore the area and lounge on one corner of the rice field and just enjoy the beautiful scenery. I would eventually go back to our room where my buddies were already waiting for me for our daily breakfast. 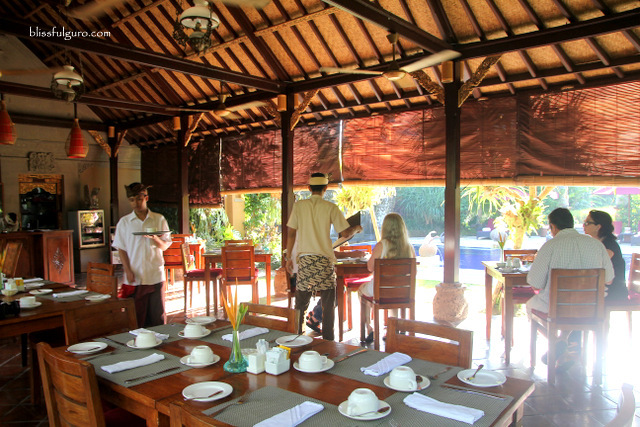 The complimentary breakfast is served daily at the Bale Banjar Restaurant. The restaurant is in the middle of the villas and the two swimming pools (yes, they have two). 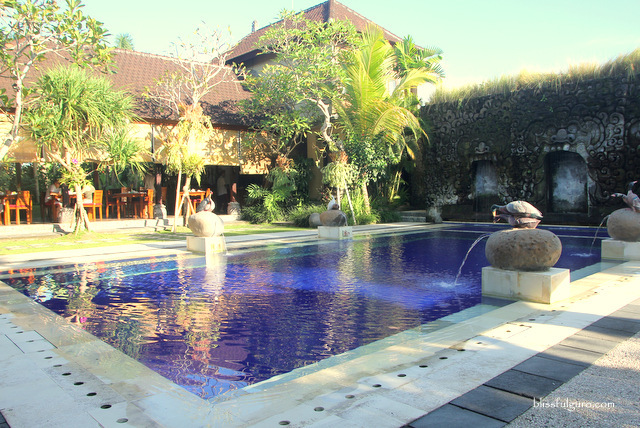 Our usual breakfast scene was relaxing with a view of rice fields and the secluded garden by the pool. 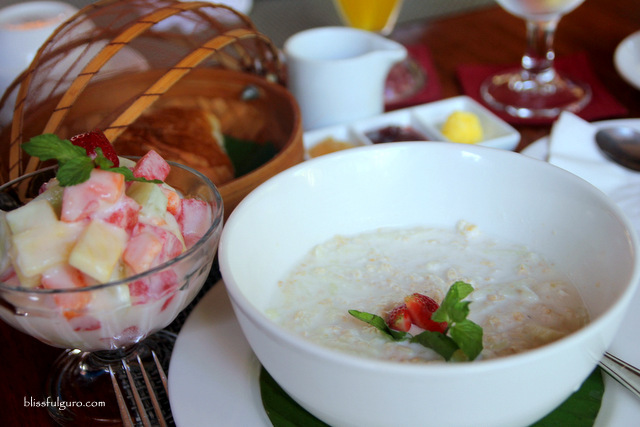 The complimentary breakfast has a wide selection from Balinese to traditional breakfast fares. I tried everything on the menu during our four-day stay. 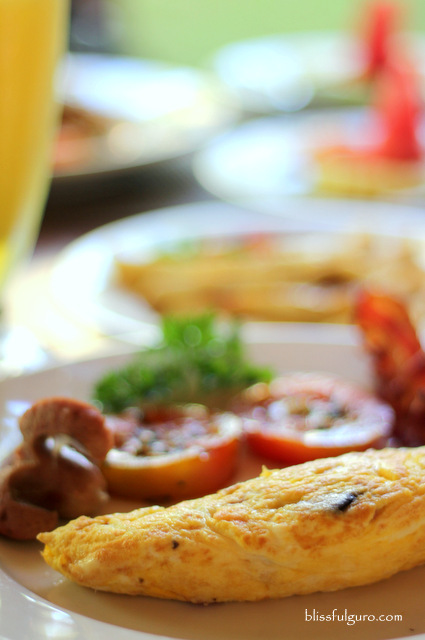 They have Continental, American, Indonesian and Tepi Sawah Breakfast menu options. 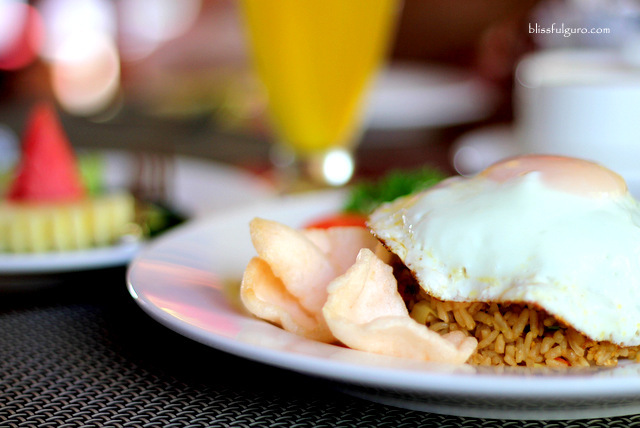 What I love the most was the Indonesian breakfast with my favorite Nasi Goreng (fried rice is love). 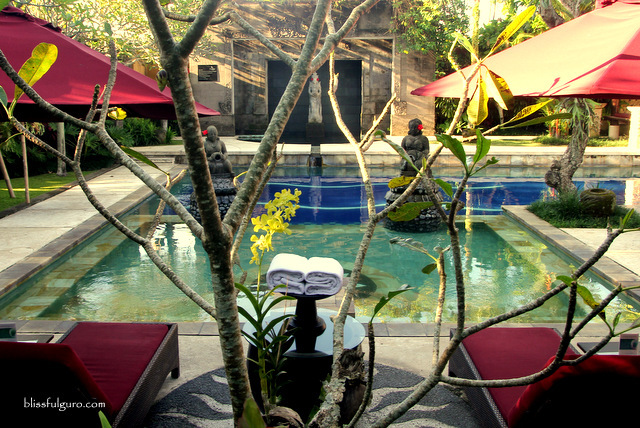 Our usual routine in Ubud was to tour around Bali the whole day and dedicate some idle time at the pool area at sundown. The warm water of the pool soothed our aching bodies. After which, we would go to the town for a nice dinner with the resort’s complimentary shuttle service to and fro town (9:00 a.m. to 10:00 p.m.). On our last day, we chose to just laze around our villa and work on our blog backlogs a bit, thanks to the complimentary wi-fi of the resort. And then it was time to go. 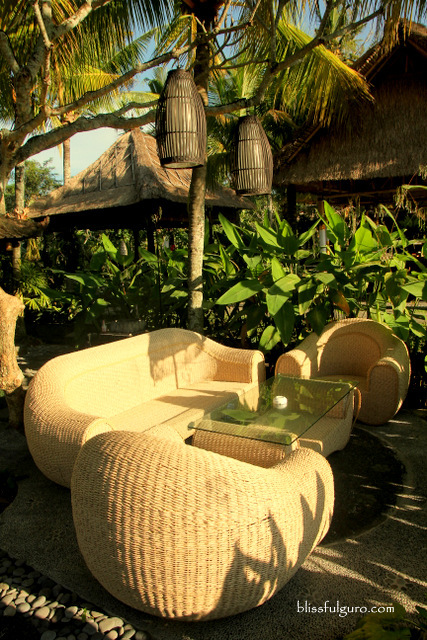 Bebek Tepi Sawah Villas is truly the perfect seclusion we’re looking for, this side of Bali. 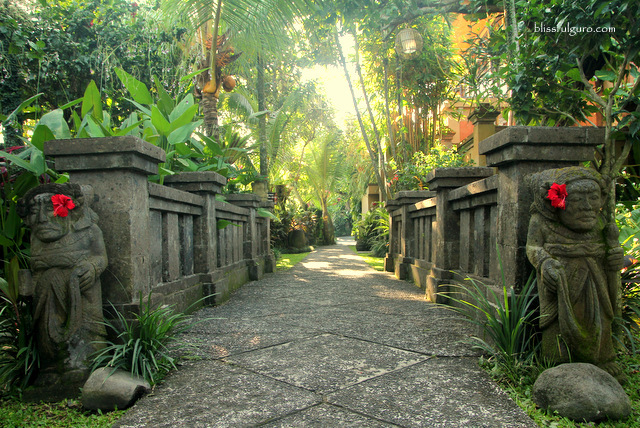 The unpretentious beauty of the scenery in Ubud was very relaxing. And I guess I’m starting to love the highlands (the beach will be my forever love though). Chong, mermaid or diwata ng dagat ka ata nung past life mo. Serene place... Lakas maka tanim ay di biro.. hindi ko inexpect yan. 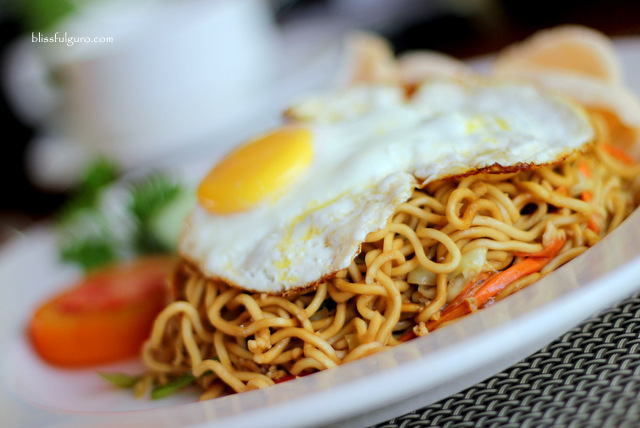 and nagdrool ako sa mee goreng!